As time has passed since my duodenal switch surgery (it’s nearly been a year! ), the rapid weight loss I was experiencing has declined to possibly nothing. This was anticipated, and as I’ve reached an excellent weight of 136, not unwelcome. However, there is still the possibility of losing a bit more weight before the slight rebound I’ve been told to expect. If I can manage to lose a bit more such that I rebound to about where I am now, that would be great. Things have become more challenging, though. In the beginning, I hated eating and had to force myself to do it. When I did, I could only stand certain foods. Over the weeks and months since, though, my tastes have started to go back to where they were before the surgery. My perspective has flipped right back to loving food and wanting to eat all the time. And I’ve become accustomed to the amount my small stomach can take in, such that I am able to pace myself and potentially overeat if I don’t pay attention. Due to malabsorption, I should not be capable of becoming morbidly obese again so long as I don’t go crazy with my food choices, but there’s nothing keeping me from being overweight but my own willpower. This surgery, after all, is not a magic bullet. It didn’t do all the work of weight loss–I had to eat right and exercise–and it will not do all the work of keeping me at a healthy weight. My need to get enough protein has made me a label-reader; I must keep up that habit. Further, I am working to limit processed foods as much as possible, as this is the best way to keep my sugar intake down. This is very difficult now that I have a taste for sugar again. My ideal is to get my sugar fix through fruit, but when I want an actual dessert, I try to at least go for items sweetened with Splenda, honey, or real sugar rather than high fructose corn syrup. And of course, I don’t drink sugary filler. Beyond eating right for health, I will also have to manage the side effects of this surgery for the rest of my life. One very unromantic side effect is that white bread, white rice, and normal pasta make me gassy. In the beginning I just didn’t eat those things at all, but now that my tastes are pretty much back to normal, I’ve been craving them. So I buy 100% whole wheat/grain bread products (not “multigrain”), and I try to only eat brown rice. Pasta has been a different animal, though. Sean and I make a lot of use of those Knorr noodle packets, because they’re simple and fast. But they don’t come in whole wheat varieties. There was a whole wheat version of the Alfredo noodles at one time, and we tried it and didn’t care for it…and that must have been the general consensus, because I don’t see it anywhere these days. I recently bought a bunch of plain whole wheat pasta in various varieties, but I haven’t made much use of them. That will require finding good sauce recipes and keeping those supplies on hand, and I haven’t figured all that out yet. I do still plan to try, but some days I consider it a victory just to leave the kitchen clean! Luckily for me, the last time I went to the store, I found a 50% whole grain version of Kraft Dinner. Obviously this isn’t a perfect solution–at 50% that means there’s still gas-inducing content–but it tastes great and so far doesn’t seem to affect me nearly as badly as the regular dinner. Sean and I love macaroni and cheese, so this is an excellent solution until I get to the point where I can make my own pasta sauces. I started some work as a temporary on-site contractor a couple weeks ago. I’d forgotten how the office environment encourages my boredom-eating. Having nothing to do but the work I’m there to do is good, obviously, but my creative, multitasking mind tends to get antsy. I like flipping back and forth between tasks; it lets my brain refresh itself and promotes my creativity. I’ve realized since going back to an office environment that I’ve used eating as a “task” to reboot my brain. I’d take a break to grab a snack and then munch on it thoughtlessly while working. This is obviously not a habit I want to get back into, so I’m working on replacing it with something else, like going to refill my water bottle or standing up at my computer. Happily, I’ve taken advantage of working in a skyscraper to use the stairs. Four flights up and down! Unhappily, working full time outside the apartment has made it impossible for me to meet my personal trainer during the week. I’m trying to figure out what to do about that. This entry was posted in Diary, Health and tagged food, life, quality of life, weight loss, weight loss surgery by Heather Meadows. Bookmark the permalink. Know about these feelings….. Good plans too. Hmm, maybe it is a telecaster! You should ask Dad. 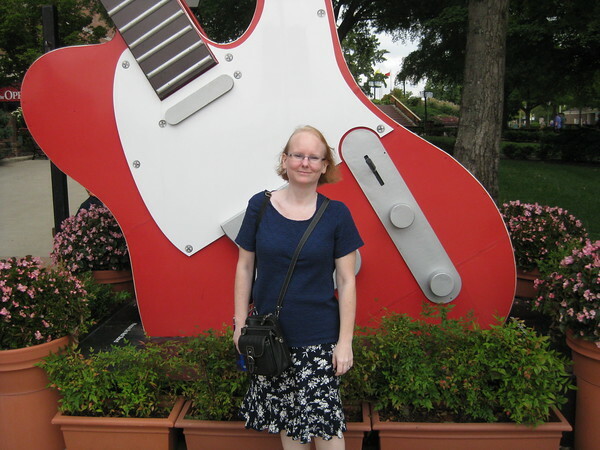 This is one of two guitars out front of the Grand Ole Opry. If 100% whole wheat pasta is too “heavy” for your taste buds, I recommend trying Tiniyaka gluten free brown rice pasta. It is still whole grain, but it is much “lighter” than whole WHEAT.